In this article we will show Unity 2018 primary views and windows; we will also cover layouts and the toolbar. The interface components covered in the post are the used most ones. This article is taken from the book Getting Started with Unity 2018 written by Dr. Edward Lavieri. When we first launch Unity, we might be intimidated by all the areas, tabs, menus, and buttons on the interface. Unity is a complex game engine with a lot of functionality, so we should expect more components for us to interact with. If we break the interface down into separate components, we can examine each one independently to gain a thorough understanding of the entire interface. As you can see here, we have identified six primary areas of the interface. We will examine each of these in subsequent sections. As you will quickly learn, this interface is customizable. 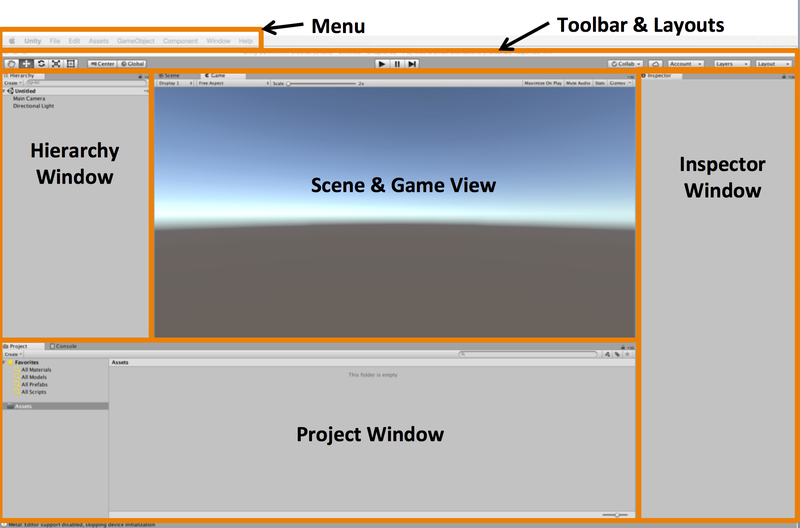 The following screenshot shows the default configuration of the Unity user interface. Unity’s menus are contextual. This means that only menu items pertinent to the currently selected object will be enabled. Other non-applicable menu items will appear as gray instead of black and not be selectable. 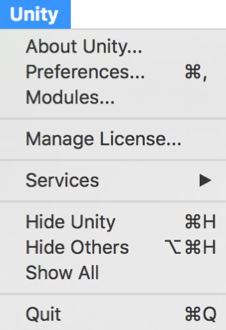 Accessing the Unity | About Unity… menu option gives you access to the version of the engine you are running. There is additional information as well, but you would probably only use this menu option to check your Unity version. 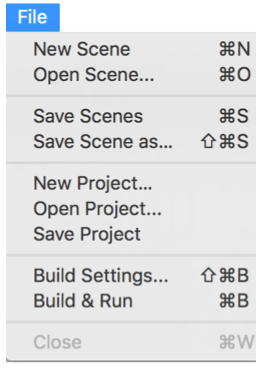 The Unity | Preferences… option brings up the Unity Preferences dialog window. That interface has seven side tabs: General, External Tools, Colors, Keys, GI Cache, 2D, and Cache Server. You are encouraged to become familiar with them as you gain experience in Unity. The Unity | Modules option provides you with a list of playback engines that are running as well as any Unity extensions. You can quit the Unity game engine by selecting the Unity | Quit menu option. 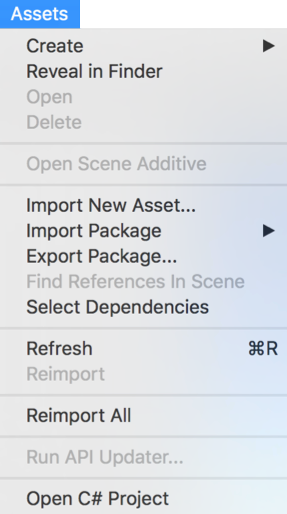 Unity’s File menu includes access to your game’s scenes and projects. We will use these features throughout our game development process. As you can see in the following screenshot, we also have access to the Build Settings. The Edit menu has similar functionality to standard editors, not just game engines. For example, the standard Cut, Copy, Paste, Delete, Undo, and Redo options are there. Moreover, the short keys are aligned with the software industry standard. The Edit | Project Settings option gives us access to Input, Tags and Layers, Audio, Time, Player, Physics, Physics 2D, Quality, Graphics, Network, Editor, and Script Execution Order. In most cases, selecting one of these options opens or focuses keyboard control to the specific functionality. You will become increasingly familiar with this collection of functionality as you progress through the book and start developing your game. We will have extensive hands-on dealings with the GameObject menu items throughout this book. At this point, it is important that you know this is where you go to create GameObjects as well as perform some manipulations on them. We know that GameObjects are just things. They actually only become meaningful when we add components to them. Components are an important concept in Unity, and we will be working with them a lot as we progress with our game’s development. It is the components that implement functionality for our GameObjects. The Layouts option provides access to various editor layouts, to save or delete a layout. Physics DebuggerBrings focus to the Physics Debugger window. Opens the window if not already open. Here we can toggle several physics-related components to help debug physics in our games.ConsoleBrings focus to the Console window. Opens the window if not already open. The Console window shows warnings and errors. You can also output data here during gameplay, which is a common internal testing approach. To summarize, we have discussed the Unity 2018 interface. If you are interested to know more about using Unity 2018 and want to leverage its powerful features, you may refer to the book Getting Started with Unity 2018. What’s got game developers excited about Unity 2018.2?